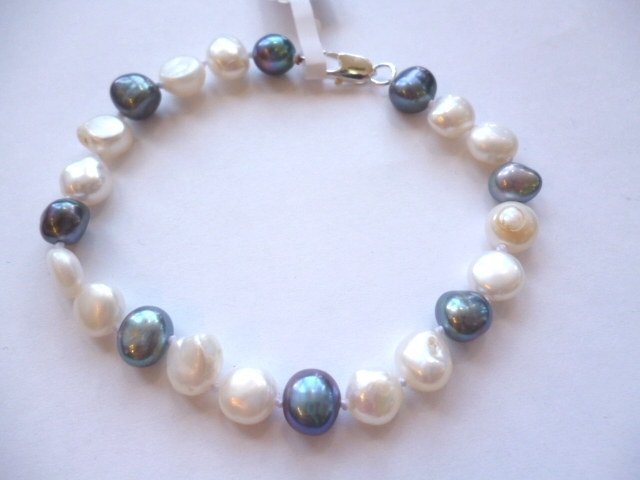 An elegant 7.5 inch bracelet of medium-sized (7.5 - 9mm) baroque* pearls with a choice of traditional carabiner (claw) clasp or a sturdy, fiddle-free magnetic fastener. The pearls are in a mixture of complementary iridescent shades - sparkling lustrous white, ivory and metallic dark grey. We'll send this in a pretty and practical silk purse or handsome gift box, at no extra charge. .
* 'Baroque' is the word jewellers use to describe a gemstone or pearl that is asymmetrical / irregular in shape. Each interesting, naturally-shaped pearl is unique and brings character to a design.